One doesn't often see a dagger that is formed of one solid piece of 440 C. This INTEGRAL dagger is hardened to Rockwell 58. Steigerwalt, so well known for his prize winning folders (more Blade Show awards than any other knifemaker), now creates four fixed-blade high-art knives a year. Here is shown the first one. Seldom, in the knifemaking world, do we see such a blend of genius art, and flawless execution. In my opinion, Ken Steigerwalt is one of the world's top-ten art knifemakers. Only a handful of elite art knife makers' work commands a higher price on the secondary market (more than their work is sold for originally). Ken is one of this handful of makers. 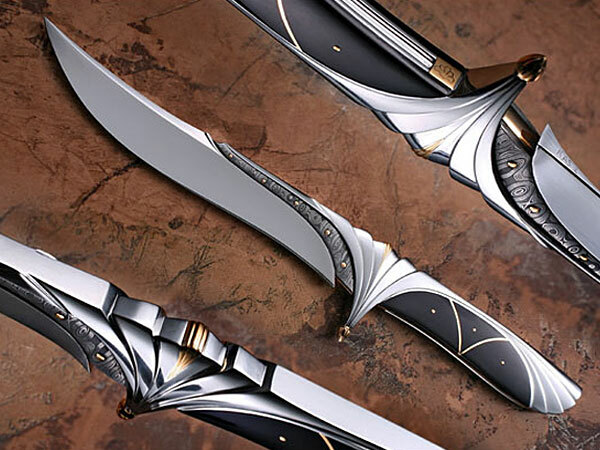 As for the superb beauty of this knife, only your eye can evaluate its artfulness and the exacting mechanics involved. Blade Steel: 440 C with 18 K Gold pins.